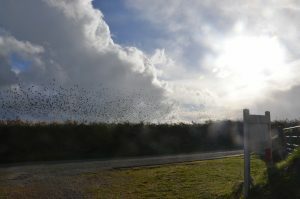 In Winter, watch spellbinding starling murmurations, when starlings gather in Pembrokeshire in their tens of thousands. Here at Yr Hafan in November this year, we witnessed this mesmerising sight of thousands of birds swooping and diving in unison, performing an aerial dance at dusk over our heads – what an amazing sight. Apparently, they gather over their roosting site, and perform their wheeling stunts before they roost for the night.